A new chapter in the history of the University of Miami’s football program began in 2008 when the Hurricanes moved to Hard Rock Stadium. For seven decades the Hurricanes played at the Orange Bowl, one of the most historical football stadiums in the country. The Orange Bowl was not only the home to the Hurricanes but was the site of five Super Bowls, 11 National Championship Football games and the home of the Miami Dolphins (NFL) until 1987. In August 2007, the University of Miami announced that the 2007 season would be the Hurricanes last season at the Orange Bowl because of the deteriorating conditions at the stadium. 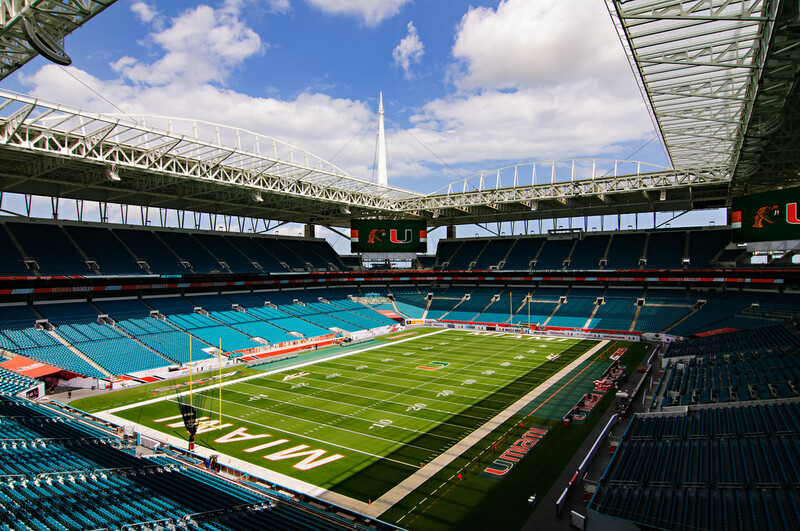 The University of Miami and the Miami Dolphins reached an agreement allowing the Hurricanes to play at their stadium. The Hurricanes played their first game at the stadium on August 28, 2008 against Charleston Southern. Originally named Joe Robbie Stadium, the Miami Dolphins played their first game at the stadium on August 16, 1987. Joe Robbie Stadium was a major upgrade from the Orange Bowl with 75,000 orange and teal seats that enclosed the field. Numerous circular ramps and escalators made accessing every seat a breeze and two video/scoreboards boards were located above the rim of the upper deck of each end zone. In 1990, in an effort to bring MLB baseball to Florida, Wayne Huizenga purchased 50% of Joe Robbie Stadium. The following year MLB awarded Miami a team, the Florida Marlins, who began playing in 1993. When the stadium was built for the Dolphins, Joe Robbie insisted on a rectangular grandstand layout that was wider than needed for football, believing that baseball would one day come to Miami. The seats in the lower level on the north side of the stadium were retractable allowing the field to be configured for baseball. For 21 season the Marlins played at the stadium before moving into their own ballpark, Marlins Park, in 2012. Although multiple areas around the facility were remodeled over the years it became apparent once the Marlins left that in order to make the facility competitive with other NFL stadiums and to host future Super Bowls the stadium would need a complete overhaul. In January 2013, Dolphins owner Stephen Ross unveiled plans that dramatically changed the look and atmosphere of the stadium. The $500 million project, financed by the team, was completed in two phases beginning after the 2014 season. The first phase included restructuring the lower deck, bringing the stands 24 feet closer to the field and removing the seating decks in the four corners of the upper deck, reducing the seating capacity to 65,326. Additionally all of the original orange and teal seats were replaced with new aqua colored seats. The second phase commenced after the 2015 season and drastically changed the appearance of the stadium. An open-air canopy, featuring four spires rising from the four corners, shields about 90 percent of fans from the outside elements is atop the stands. Four HD videoboards are in the corners of the upper deck to enhance the fan experience. The project was completed before the start of the 2016 NFL season and makes the facility one of the premier stadiums in the NFL. The home of the Dolphins has had many names since opening in 1987 including Joe Robbie Stadium, Pro Player Stadium and most recently Sun Life Stadium. In August 2016 the team sold the naming rights to Hard Rock Cafe for $250 million over $18 year. It is now known as Hard Rock Stadium. The stadium has been the host to two World Series in 1998 and 2003, five Super Bowls in 1989, 1995, 1999, 2007 and 2010 and the annual Orange Bowl game. 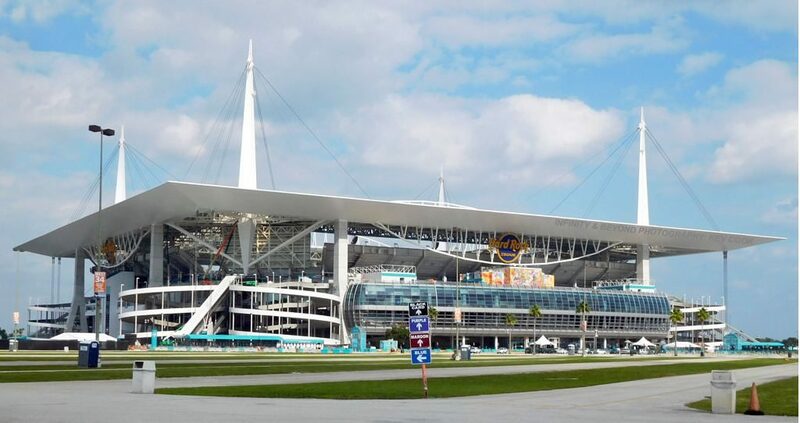 With the completion of the massive renovation project at Hard Rock Stadium, the City of Miami was able to secure the 2020 Super Bowl and the semifinals of the College Football Playoff on December 29, 2018.